Panzer Digest Naval War Special is a 90-page book, released in June 2018. This issue contains three naval games. Monitor vs Merrimack 1862 is a simple, tactical naval combat game depicting the Battle of Hampton Roads during the American Civil War. (This is a slightly revised, new edition of the previous Monitor vs Merrimack game). Tsushima 1905 allows you to refight the Battle of Tsushima, between Japanese and Russian fleets, in the last great pre-dreadnought engagement. It uses the Battleship Captain game system, with individual ships rated in a number of offensive and defensive categories. Great War NavTac 1914 focuses on the exploits of the German battlecruiser Goeben during World War I, and uses the NavTac game system, with 15 fully rated, historical warships. Game components and ship counters are printed within the pages of the book, and must be scanned and printed before play. 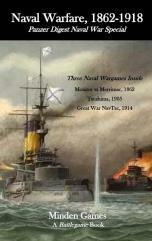 This book is cross-listed as Naval Warfare, 1862-1918, being Volume 6 in Minden's Battlegame book series. The games in this edition reflect Minden's traditional emphasis on historicity and playability. Besides the three games, this issue contains several articles (The Role of Ammunition Supply in Naval Simulations, Battleship Captain WWI Monitors, Experimental Jutland '16 Rules, Taking a Look at the Naval Wargames Society), and more.